Perhaps what’s most surprising about the picture – or perhaps not, given Freaks – is how little interest it has in the better-known Stoker characters; John Harker (David Manners) barely registers, while the plights of Mina (Helen Chandler) and Lucy (Frances Dade) fail to elicit concern. Instead, Browning seems entirely preoccupied with Dwight Frye’s Renfield and his escalating madness (the line from Frye to Andy Serkis Gollum is surprisingly distinct). It’s Renfield we follow to Transylvania for a first meeting with the count, much to the consternation of the usual bunch of yokel locals; Frye’s the picture of the vapid silent era lead in these scenes – to send it up, imagine Charles Hawtrey in his stead – making his subsequent derangement all the more effective. Not so effective are the effects themselves, however; you’ll be hard-pressed to keep a straight face when Renfield looks out his carriage to see a bat on a string leading the horses. Dracula: The spider spinning his web for the unwary fly. The blood is the life, Mr Renfield. Lugosi’s now better known for being played by Martin Landau in the tired dogend of his career, when only Ed Wood would give him regular employment, but even here, he’s essentially playing a stiff, an effect – and an affect – underscored by the chiaroscuro lighting on his eyes and eccentric accent; there’s an assumption of his impact that, since it’s underwhelming, immediately invites amusement. He’s closer to a slumming it Bond villain than a fearsome individual, even if he initiated the more popular subsequent portrayals of the count as a debonair gentleman. Renfield: Isn’t this a strange conversation, for men who aren’t crazy? Van Helsing: Renfield, you’re compelling me to put you in a straightjacket! 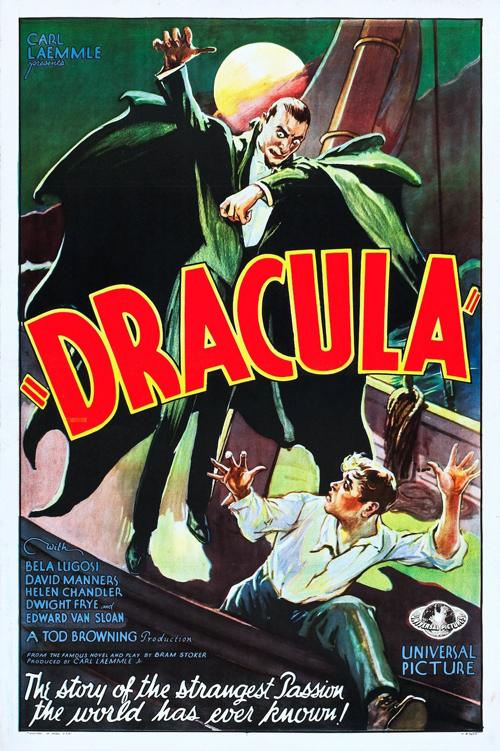 Nevertheless, Dracula is engrossing during the early stages, and only begins to drag when the Count embarks for Blighty. The rather ambivalent tone is subsequently alleviated by the scenes with Van Helsing (Edward Van Sloan) and in the sanatorium. Van Sloan makes for a very modern, open-minded nemesis for Dracula (“The superstitions of yesterday become the scientific reality of today”), and his interactions with the now locked up Renfield are some of the best in the picture. The scene of Renfield crawling across the floor towards a maid, meanwhile, is one of the few that retains potency. Elsewhere though, lines like “Dracula is in the house. In the house!” and John, oblivious to the implications of Mina announcing “I love the night” while cursing “There’s that bat again!” do nothing to dispel an impulse towards the derisory. It’s been suggested that cinematographer Karl Freund was left to take charge of much of the shoot by Browning, which would explain a lot. If one’s seeking out an early vampire film that evidences what could be done, cast your eyes back nearly a decade earlier and check out FW Murnau’s Nosferatu, a truly uncanny vision (and one that fell duly foul of copyright infringement).